This is a model based on the plans and info acquired of the Slave ship La Concorde (1710), which is the ship Blackbeard captured and converted for his use, and renamed to Queen Anne’s Revenge (1717). There is of course dispute about her being a French-Dutch built, French-French built, and of course English built. We have gone by the idea of the English built La Concorde. This is first of all sincewe like the style, and that it has been easier to acquire info about this theory. We have used the artwork, plans and pictures of the model that sits in North Carolina Maritime Museum. We could not find any real references to La Concorde’s stern gallery – except from the sides, so we have done an educated guess from the other ships of the era. The stern gallery is partly also inspired by the Whydah, which was captained by another famous pirate – Samuel Bellamy. 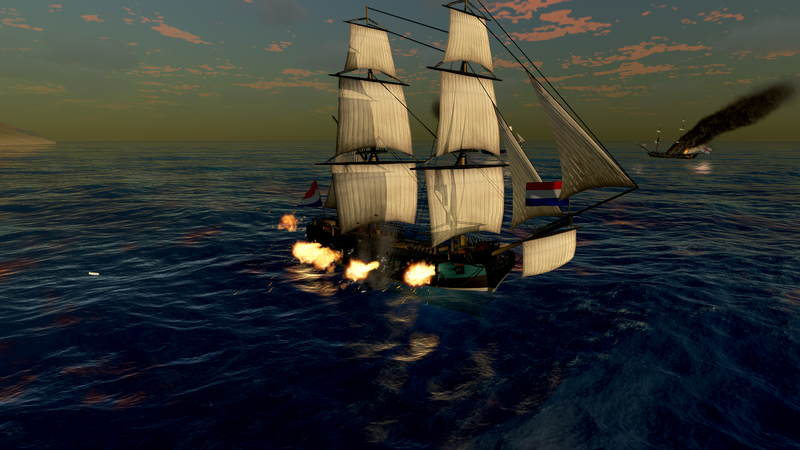 We have also let my self be inspired by the old Hercules Mastercraft Frigate that Christian used to captain in Port Battles while playing Pirates of the Burning Sea. We have probably added a few guns more than she originally had, and we suspect she had allot of antipersonnel swivel guns making up some of the gun count. 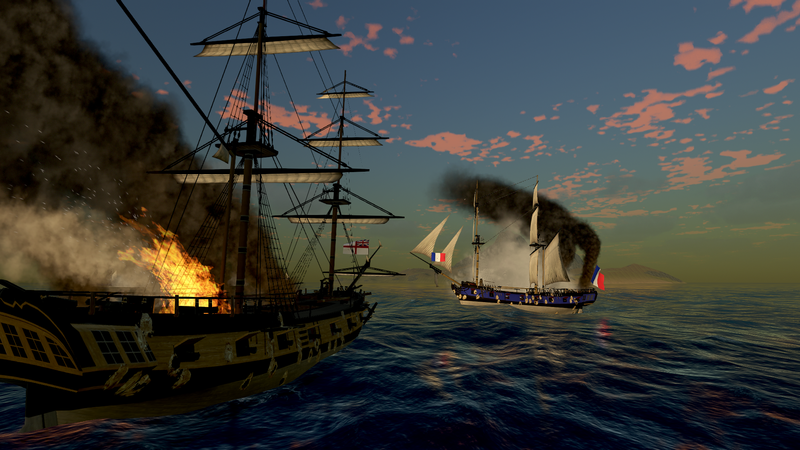 But we made the ship for us, and for our game Tides of War and Lonely Castle Studio’s game in development – Sea of Honor, and so the gameplay comes first. We were neither trying to be 100% accurate or historical correct. Greetings all and welcome to the December Devlog update! A lot has happened since our last update, and we are anxious to share the results – and plans for the future – with you all. We moved to Itch.io for our releases and updates, therefore making patching and updating clients MUCH easier. Be sure to download the demo through the Itch.io client to keep up to date! What does Build v0.3 consist of so far? 5 Nations to play as; English, Spanish, French, Dutch and Pirate – More nationalities will come at a later point, such as China, Russia and young America. Functioning flooding and fire system on board that must be fought if occurring. In addition to testing it for hours and hours internally, we have also run open servers and tested the current build with many outside testers. And we have also joined privately set up servers. It has been a blast and taught us a lot! Although the build is running smooth and very stable we did encounter a minor Networking issue that sometimes does not allow the player to connect to a server if they have just jumped out of another due to a long running master server timeout. Normally they have only had to wait for about 5 minutes and it was sorted out. Although we have looked into the matter, we are focusing on fixing this bug for the coming .0.4 build. The next build is the biggest update so far and features a completely reworked/rebuilt game with increased performance and vastly improved code, furthermore it will also mark a new milestone for further development as we now will start to put in the finer details such as skill systems, upgrading systems and more. Features that will be added to the existing ones to expand the game to new heights. Finally, it is exciting to show you some updated screenshots of the ongoing modelling work. All of these models near completion and consequently will lead to more ships making their way into the game when finalized. In conclusion, download a copy today and give it a spin. We look forward to see you on our test servers! Who knows, we might hop in and say hello! May the winds always be in your favour and lady luck on your side! Probably one of the largest changes for this build is an all new settings and performance system. In the previous versions the options were rather limited as we really hadn’t nailed down our effects stack or assets being used, but as we get more solid on those we really needed a new way to manage settings for video, audio, performance, and controls. What has spawned of this is a very robust and flexible system that can be used as framework for any of our other projects in the future. Most individual selections for settings range from ‘low’ (for lower end hardware) to ‘ultra’ (for top end machines). The system stores these settings in an accessible JSON formatted settings file and will later allow multiple versions to be stored so a player could store a ‘high’, ‘medium’, and ‘low’ type of preset in their machine and not have to reset all of the settings every time. We have exposed nearly every video setting that won’t change the game to the point of making it unbalanced with some features allowing the player to add/remove contrast from the screen for accessibility to those with color issues in their vision. Each option for effects can have rather different performance impacts on different systems so we wanted to open up the system to be very flexible so that it can apply to the widest variety of systems. Here is a rundown of the current video options. Bloom Threshold – Some of us don’t want ‘J.J Abrams’ levels of bloom, so this allows that to be adjusted in game. Shadow Distance – Adjust how far away shadows render. Closer distances means higher quality. Dynamic Global Illumination – This can replace standard lighting, but has a few limitation and is really made for high end hardware. The results are fantastic though. This is still in its infancy but is getting some work done soon. Through this panel you can adjust the volume of different ‘channels’ of sound and change the number of channels (stereo, 5.1, 7.1, etc). The ocean system in the game is a major performance factor for some players. It can range from low detail to photorealistic based on the hardware that the player has. We have allowed as many options as possible to both allow players to get the best performance, but not gain any advantage on others through changes in the settings. 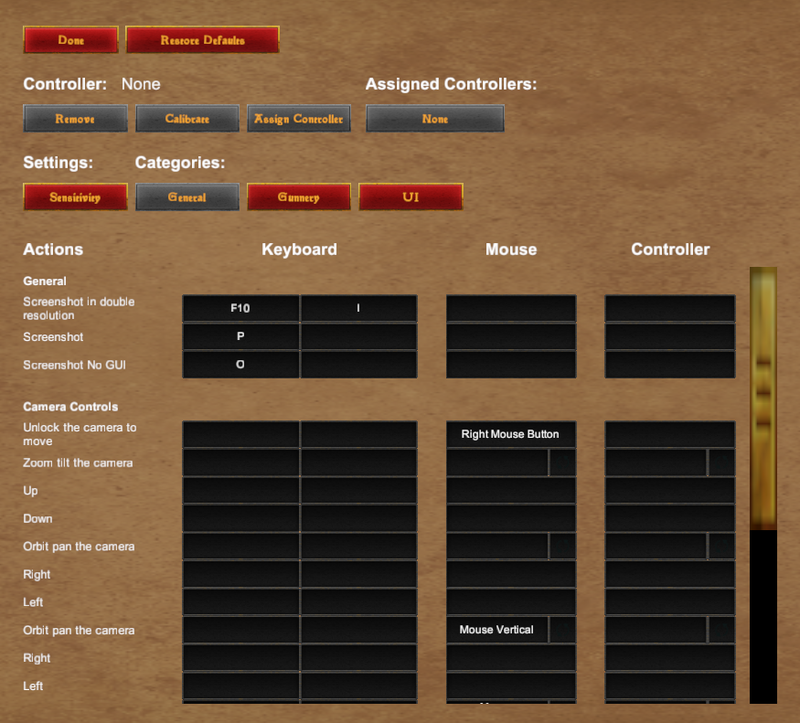 Controls for keyboard and even controllers can be set through this panel. Every input is allowed to be mapped to any controller or interface that we can connect to, with more profiles being added every month, usually. One of the largest critiques we take is that using cloth objects in Unity is an expensive way to render the sails. Well, we wanted to do some testing to make sure that we weren’t costing our players too much so a new ‘game’ was written to test how many sails could be rendered in full detail on moving ships with dynamic changing wind. Well, it is a LOT before there are performance issues seen. The Unicorn project is still paying off in terms of textures with a new set of emissive textures we can use for lighting the glass on the ships. New iron and floor textures are also forthcoming. These are constantly being updated based on the lighting of the Unicorn project and will be updated almost every week until we get them just right. The newest addition(s) to our fleet will be a collection of brigs and snows. Sporting 22 guns (at least) of mostly 6lbs, it is a formidable ship in a fight with plenty of power and quick turns. The master server system (how players find battles) was originally based on another system and was starting to show some weaknesses. After a complete rewrite and a full rebuild of the mechanisms we can now say that we have the most optimized version going. Games will be able to be sorted by their map, game type, and even what DLC or mods they may be running. Private server systems have also been updated so as to keep the game server from having to manage password attempts by letting the master server control their initial attempt to connect to the game. The fun of testing optimizations is upon us. We built a new project and started to test every type of material, texture, and model optimization method we could. 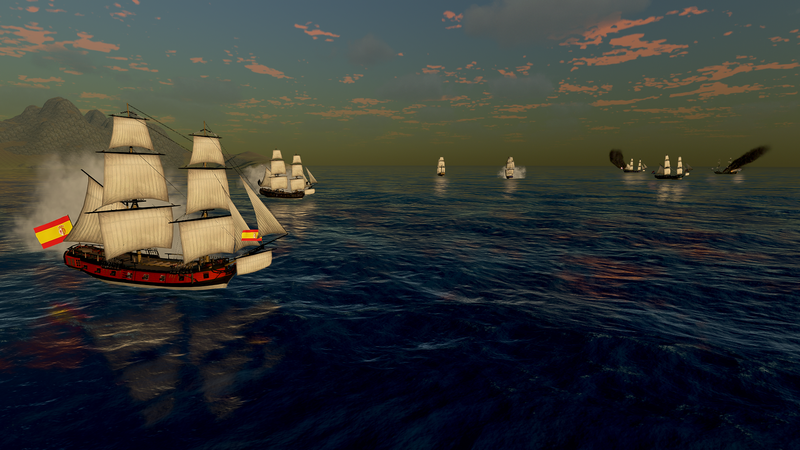 Currently we are looking to support 64 ships in a hosted battle, so the system for the models needs to be very smooth. The fruits of the HMS Unicorn Project are starting to pay off. We have better and more efficient materials for the ships. A new update to the wake and foam is getting some love. The foam has a much more natural look (since it was taken from a real photo) and has also been optimized and adjusted for distance detail. Nothing beats getting into a fight and a storm rolling in. Now the effect of the rain and fog compounds the difficulty of the fight, leaving the player to have to navigate by sound and light of an enemy’s guns at times to find the battle. 16 person battles are getting tested and we have successfully had more than 1 go through without a crash! To say that it is a brawl is an understatement. Cannons are going off rapid fire and wood chunks are flying! Making more progress on weather this month. Added in a more customizable system that allows for a better synchronized cloud and sky state with better horizons that match our ‘cinematic’ style. Evenings and nights are more colorful and the lighting is much improved. Smoke got a bit of an update as well. It now reacts to ambient lighting conditions to give a more natural look. Smoke is also getting a new shader to help give it a more volumetric appearance and to help occlude the enemy ships better. Draw order of the smoke and water was corrected in the March build so that splashes no longer showed up in front of smoke. Tides of War – New Name, New Ship, New Scene, Better AI! Welcome to the first Tides of War devblog! We are kicking off the month with a new devblog covering the changes taking place. Lets hit the largest topic first. The name of Letters of Marque has been changed to Tides of War: Letters of Marque. There are several factors that led to this. First, after several tests we found that the word “marque” was hard to convey correctly. Most testing showed that people tried to search for ‘mark’, ‘marc’, or even ‘marquee’. Second, we had set the name Letters of Marque as something of a working title and really just never got around to getting a new name since we were rather busy with mechanics and art. Third, we want to grow the game series beyond a single game with a theme that binds several games together, and the current title was not good for that. Fourth, we wanted to do the name change before we reached anything close to an alpha stage where the name would be associated with the product from that point on. After quite a few meetings we voted through many names and finally settled on Tides of War as the major series title and Letters of Marque as the subtitle for the first project that is currently underway. Along with the name change, the domain address, IndieDB link, and other marketing material is being switched over so be sure to update your links to the new versions. Along with that comes the NEW LOGO! Look forward to seeing this getting pushed to all of our media outlets in the next week. We look forward to feedback on the new design as well! The newest ship is getting built into the game! It is an 18 gun Sloop based on the HMS Fly (1776), a Swan class sloop. Her crew of 125 were packed tight into the 29.4m long hull. With her drawing 2m of draft she was a light and fast cruiser used for convoy duties. The design was used to build 25 vessels from 1766 to 1780. She initially carried 14 x 6lb cannons and 16 swivel guns. Later refits allowed for 16 x 6lb guns and 2 x 12lb carronades. Some models even were upgraded to 4 more carronades on the quarterdeck for a total of 22 guns. Quite the armament for such a small vessel! The first of our new battle scenes is called ‘The 5 Islands’…. real original, huh? It is a varied set of small islands with cuts and inlets around the map that allow for a more varied tactical approach to the battles. The new terrain includes houses, trees, rocks, beaches, etc. All the basics needed to create a much more immersive environment to sink and capture each other in. In our quest to be able to get the AI to the point of not being completely useless we have started the process of implementing behavior trees for them. What this means is we can begin to add in many new mechanics that the AI will be able to utilize beyond the current “target, navigate, shoot” they are currently running. As our new levels are created, they are mapped to use navigation meshes that will enable more robust ship movement, including being able to not have them run aground constantly. We look forward to having more engaging battles with the AI ships for those that enjoy single player matches. Combined with new ships and new levels, it will be a great time sinking your enemies! A subtle, yet powerful clue to a ships speed is the wake it is leaving behind. The faster they are moving, the larger and longer the wake will be. 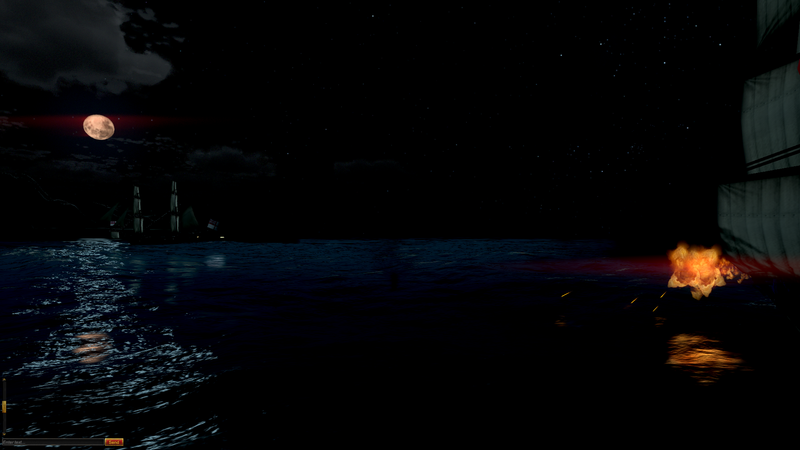 To that end we have added a new wake to the ships to give a more realistic look to their motion. The new wake modifies the water surface height, adds a change to the normal maps behind the vessel, and even makes new foam trails based on the speed it is moving. So far we are very pleased with the effect and look forward to tweaking it some more to make it even better over the next few weeks. It is coming, we promise! The ship addition process is getting refined and we expect the newest build to take another week or 2 before it is fully ready. We have a few new systems to get put in (which will be explained in the next devblog) and we want them to be more stable before pushing them out. Until that time you are still welcome to play the current release from our website. Yes, we know it doesn’t have the new name, but the new version will! Hope you enjoy the latest info and we hop to see you out on the seas soon!